The door closed, and I was alone. I didn’t mean to whine, but when you’re a writer facing permanent blindness, a few whiny words slip out. Sterile silence answered my questions. “He’s coming in for you.” His gentle hand assisted me out of the chair and led me toward the door by the elbow. It would be a very long, miserable night. By the next morning, thousands of invisible pins pricked my body. My head ached, and walking outside turned sunbeams into fiery branding irons that seared my corneas. My husband drove me to the eye doctor. Fresh tears careened rivers off my face. I could hear him rifling through papers. In that moment, I decided to obey, and my whole perspective changed. I knew that if God wanted me to write or do anything else, He’d make a way. Others had authored in spite of blindness. Helen Keller, Jennifer Rothschild, and Jim Stovall came to mind. 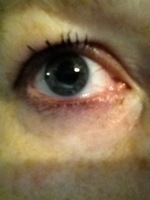 Several days later, I met with Dr. Malhotra, a cornea specialist, who quickly identified the problem. He diagnosed me with Cogan’s Dystrophy, or Map-Dot-Fingerprint Dystrophy. It took almost five weeks for the torn skins over my corneas to heal. My sight slowly returned. It was September, 2009. Flash forward, three years. Though my vision challenges me from time to time, I’m able to see, and I write nearly every day. To maintain my sight, I take fish oil and vitamin supplements, use lubricant drops daily, and put salt ointment in my eyes at night to keep the skins taut and smooth. I’ll do this the rest of my life, and hope for few corneal flares. Cogan’s Dystrophy makes it appear as if a fingerprint has been left on each eye, hence the more common name. I choose to believe God branded me with His own fingerprints to fulfill His special purpose in my life. I once was blind, but now I see. And whether I’m to do it with my eyes or not, I will answer His call to write. What obstacles have you overcome to fulfill your call to write? This entry was posted in Encouragement, Writer's Life, Writing and tagged anita brooks, blindness, Helen Keller, I once was blind, Jennifer Rothschild, Jim Stovall, Map-Dot-Fingerprint Dystrophy, Writer by Anita Agers-Brooks. Bookmark the permalink. I had a stroke five years ago, rendering my right hand unable to do much. I’ve been doing my typing with one hand. Yeah, it’s a pain, but I’m not letting it stop me. Have you tried any speech to text software? Speech text software is very interesting. I had a friend with ALS who used it for awhile. Sadly, he passed, but the technology gave him a whole new lease for quite some time. Good thought, Sharon. I have, and I’ve gone back to typing with one hand. I found that talking a story and typing it are two different animals. Using VR software involves training the software to understand me, and training me to take the manual part out of writing. The former is easy; the latter… eh, not so much. You go, John. The harder the effort, the sweeter the reward. What are you writing? Anita, I need to know more about your eye care routine. I have Corneal Epithelial Dysplasia and bits of my cornea flake off causing all kinds of irritation. Hi Sharon, I’m now under a very regimented eye care routine. Newer evidence points to the healing power of Omega 3 for the eyes, especially when it comes to lubricating chronic dry eyes. 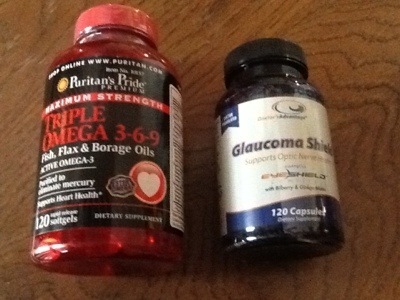 I take pharmaceutical grade fish and flax seed oil daily, my preferred brand is Puritan’s Pride Triple Omega 3-6-9. 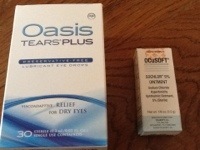 I also use Oasis Tears Plus drops throughout the day. And at night, I use a salt ointment to tighten the skins on my corneas. My cornea specialist now has me on a special supplement created by Dr.’s Advantage for Glaucoma prevention. I see my doc every six months. You might check with your physician to see if any of these could help you. 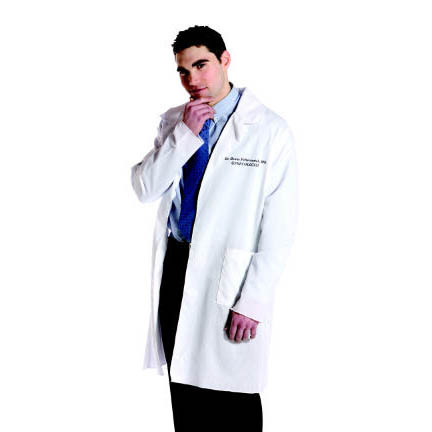 My doctor is wonderful — he stays on top of the latest research. Blessings and healing, my friend. Anita, Thank you so much for sharing your story. I, too, am a writer – a novelist – facing eye problems, but nothing as intense as your situation. In my life, parent care situations often take me away from my writing. The next time I get discouraged, I’ll remember your story. I’m so glad I could encourage, Sue. We all have a story, we all have difficulties, but we all have God if we’ll call on Him. He makes a way where there seems to be no way, and another thing that helps me, is to remember He is the Author of Time. When other things take me away from writing, I ask Him to create a little extra time for me. And He’s faithful to provide. Anita, this is such an inspiring story! None of us know what we will face tomorrow, but your words, “Trust Him” will see us all through. Praying your eyes continue to be a great tool for God to use to bless others! Thank you, Dianne. If it wasn’t for God, I could do nothing, but through Him who strengthens me, all things are possible. Nothing like going through the fire to learn how very true this is. Equally praying blessings on your endeavors. Keep us posted on your progress. Wow. I’m so glad everything is Doing better! Thanks, Anita, for sharing your story. When I was writing (back in the 90’s when I published about 20 works of nonfiction), the biggest problems I had was finding time, slow computers (i.e. the 286), and sore fingers. Thank you, Shellie. Without Jesus, there would be no journey, would there? Thank you for sharing your story, Anita! I had cataract surgery last summer. After my eyes healed (quickly and painlessly), I was amazed at how much I could see. The cataracts had been growing slowly for about 20 years, and slowly clouding my vision – kind like the proverbial frog in a pot of boiling water. I hadn’t realized what was happening. I vowed then that I would never take my vision for granted – but I also have an inkling of understanding of what it’s like to have impaired vision. Thanks for the reminder to be always thankful and trust God. He always knows best. Isn’t it amazing how many authors are challenged by writing issues? What a blessing when God shows up in our weakness so He can be made strong. Prayers sent for your own sight. Thank you, Jan.
Oh. My. Word! This is so powerful but your perspective is even more amazing!! This has blessed me today. We do serve a Mighty God — thank you for your words of encouragement, Jordyn. What an inspiring story! I face what I call obstacles every day, but now I’m putting them in perspective. “Too busy”, “writer’s block” and “lack of organization” are not obstacles at all. Your story is making me get off my duff and write! May God continue to bless you on your amazing journey. I never really thought about this the way you just worded it, Glenda. Thank you for your amazing perspective. May God your Provider, give you everything you need to succeed. Blessed to be a witness to your journey, Anita! Your life story and your narratives continue to inspire me. Write on! And I can say the same about your journey, Karen. What a gift to have writing friends to encourage and inspire. Thanks for sharing, Anita! I really appreciated your post and everybody’s comments. You inspire me to persevere through my own difficulties. God bless you! Thank you, Cheryl. Your book, A Friend in the Storm, has definitely inspired me. Wow. Thanks for sharing that, Anita! Thanks for this post, Anita. I love the idea of claiming scripture! Claiming scripture has changed my life, Jan. I appreciate your comment.